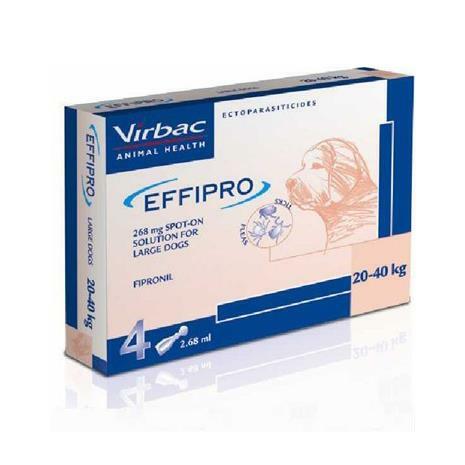 Effipro Spot-On for Large Dogs 40-80 lbs (20-40 kg) - 4 Pack treats and prevents dogs from flea infestations for up to 8 weeks and tick infestations for 4 weeks. Effipro Spot-On treats flea (Ctenocephalides spp.) and tick (Dermacentor reticulatus) infestations. Insecticidal efficacy against new infestations with adult fleas persists for 8 weeks. The product has a persistent acaricidal efficacy for up to 4 weeks against ticks (Rhipicephalus sanguineus, Ixodes ricinus, Dermacentor reticulatus). If ticks of some species (Rhipicephalus sanguineus and Ixodes ricinus) are present when the product is applied, all the ticks may not be killed within the first 48 hours but they may be killed within a week. Apply direct to the skin. Each pipette contains 2.68mL (268mg) of fipronil. This product can cause mucous membrane and eye irritation. Therefore, contact between the product and the mouth or eyes should be avoided. In the case of accidental eye contact, immediately and thoroughly flush the eyes with water. If eye irritation persists seek medical advice and show the package leaflet or the label to the physician. Avoid contents coming into contact with the fingers. If this occurs, wash hands with soap and water. Wash hands after use. Do not smoke, drink or eat during application.